Now, here’s what I’m playing all these LPs on. It’s my totally groovy Califone 1430C record player. It gets great sound. 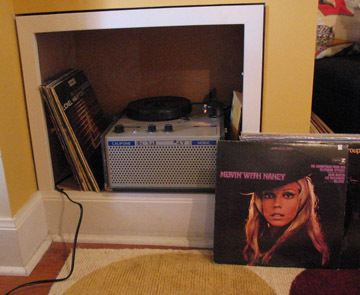 Note the killer Nancy Sinatra LP in front. Thanks for finding that one, Valerie. 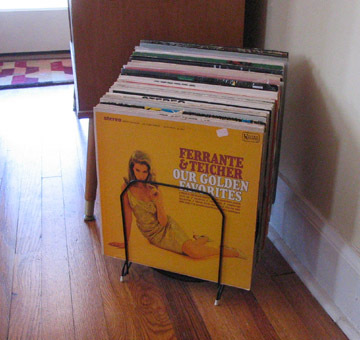 Here’s my cool record rack I found for $1. It doesn’t hold very many, but it looks great. 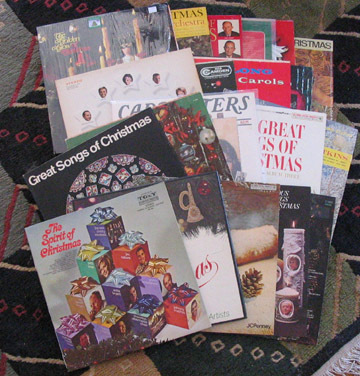 I have it filled with all the Christmas LPs plus some I’m using just for art. Most of the LPs have great cover art, but the record is in bad shape. For $1 I don’t mind paying for some kitsch. 5 simple words for you…. “Whipped Cream and Other Delights”. I have two copies. One was my grandmother’s (and is useful only as a coaster) the other I bought to play. I also have about 6 other Herb Albert LPs.